This is the second post in the series discussing receiver diversity in a wireless link. 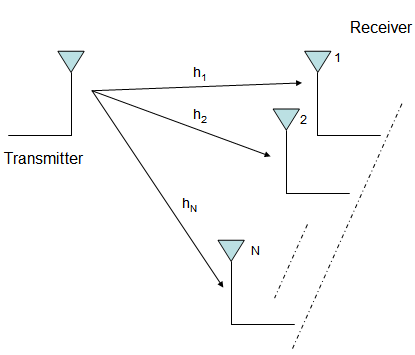 Receiver diversity is a form of space diversity, where there are multiple antennas at the receiver. The presence of receiver diversity poses an interesting problem – how do we use ‘effectively‘ the information from all the antennas to demodulate the data. In the previous post, we discussed selection diversity. In this post, we will discuss equal gain combining (EGC). 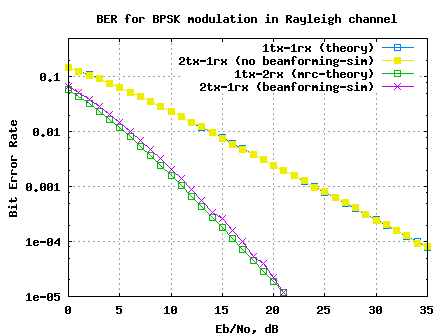 For the discussion, we will assume that the channel is a flat fading Rayleigh multipath channel and the modulation is BPSK. We use the same constraints as defined in the Selection Diversity post. Let me repeat the same. 1. We have N receive antennas and one transmit antenna. 3. 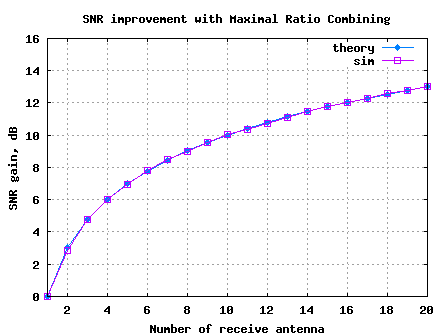 The channel experienced by each receive antenna is randomly varying in time. For the receive antenna, each transmitted symbol gets multiplied by a randomly varying complex number . As the channel under consideration is a Rayleigh channel, the real and imaginary parts of are Gaussian distributed having mean and variance . 4. 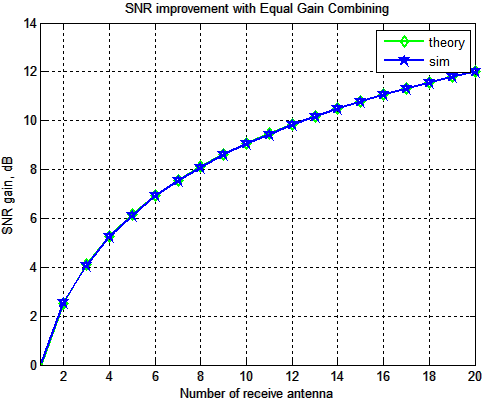 The channel experience by each receive antenna is independent from the channel experienced by other receive antennas. The noise on each receive antenna is independent from the noise on the other receive antennas. 6. At each receive antenna, the channel is known at the receiver. On the receive antenna, equalization is performed at the receiver by dividing the received symbol by the apriori known phase of . The channel is represented in polar form as . The decoded symbol is the sum of the phase compensated channel from all the receive antennas. is the additive noise scaled by the phase of the channel coefficient. For demodulation, we use the classical definition i.e. For PSK modulation schemes, the equalization by the phase of the channel coefficients suffice. However, for QAM case, we need to compensate for the amplitude also when equalizing. We are NOT discussing QAM case in this post. The equations listed below obtained from the article Receive diversity – Notes by Prof. Raviraj Adve. The effective Eb/N0 with equal gain combining is the channel power accumulated over all receive chains, i.e. 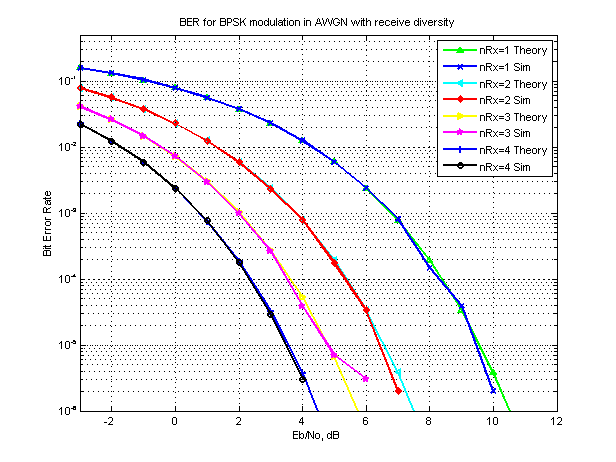 The IEEE paper [ZHANG97] discuss the BER computation with Equal Gain Combining. Since the proof is tedious (and I did not understand) I am just noting the final results. (b) Multiply the symbols with the channel and then add white Gaussian noise. (e) Repeat for multiple values of and plot the simulation and theoretical results. Can observe that the simulation results are in good agreement with the theoretical results. I’m confused between Equal Gain Combining (EGC) and Square Law Combining (SLC) schemes. Can you please elaborate the difference between them. As per my readings, literature says that they are different schemes, but I think that they are the same. @Humayun: In equal gain combining, all the received copies of the signal are used with the same weight. However, in maximal ratio combining, the received copy with lower strength is given lower weightage. thanks for this wonderful post on EGC. please is this code for GSM or CDMA system? @Arinze: This simulation does not specifically target GSM or CDMA system. It is for a simple flat fading case. What is the significance of the above statement?? Cant we just multiply ‘h’ by ‘s’?? Hello, when using EGC for PSK , is it necessary to divide the summed y with sum of channel gains at that moment from all receiving antennas? In that equation, you simply divide the phase term but the channel gains still remains there. Or maybe i’ve missed some assumptions? @linkin8834: Maybe I did not do it because it is BPSK and the amplitude scaling does not matter. In the first expression for effective Eb/No, shouldn’t it be the square of the sum of all h’s(power of the combined signal) rather than sum of squares(sum of the powers of individual signals)? With the expression that’s mentioned here, I don’t see how you get to the next expression. @Sharad: In EGC, we make sure that the phases add constructively. Hence the sum of squares of powers makes sense. Agree? I was trying to do a simulation for EGC using Monte Carlo simulation (not as shown above). I followed the same steps, but the BER values still high (order of 10^-1). I don’t know why? I tried to implement the EGC using the Monte Carlo simulation and it didn’t work. Is there any explanation? when trying to take the BER average for only two iterations I get answers of the order (10^-1) while when trying it only one time, I get very low values of BER which is what I want. Can you tell me if Equal Gain Combining is possible is time domain. If so, can I implement it this way, that I simply sum up the number of chips that come in a Spreading Factor. Is this the correct approach? Hello, I am using Equal Gain Combining to extract frequency domain diversity in MC-CDMA, but having problems with it. At the transmitter, I modulate the binary data and repeat the symbols of each user on a given number of subcarriers, multiply it by a frequency domain spreading code (a row vector) and add the spread data of all users to have a composite signal. At the receiver, for user 1, I multiply it by the same spreading code, and then use EGC to combine the modulation symbols. To get the sum of all symbols. The problem, is the when I demodulate the result, there is a large error. I must mention that this runs will for BPSK but shows errors for QPSK. @communications_engineer: Well, once you despread at the receiver, are you seeing the same information as was transmitted? Maybe to debug, try without spreading. @maya: Though I have not played with the equations, I believe it would be possible to use equal gain combining when there is a MIMO link with diversity. However, as you maybe aware, using Maximal Ratio Combining might be the most optimal approach. i am working in MIMO systems. In the Equal Gain Combining’ code, the dephased output from N receive antennas are added and then the result is processed with hard decision decoding. My question is, should not the result of addition from N antennas be divided by the number of receive antennas (N here) before going for hard decision decoding? @kunal: Yes, I agree. However, in BPSK modulation even if we do not do averaging, it does not matter as we are concerned only with the sign of the received symbol. Agree? sir currently i am involved with equal gain combing with 16-QAM.how to equalize with amplitude in QAM,please let me know.or any cite or book that i can get some reference about the amplitude equalization for EGC,16-QAM.awaiting for an immediate response. Were you able to adapt that for 1 transmit 1 receieve Rayeligh channel scenario? 1.Is optimal combining technique the same as Ml detection at the receiver in case of receive diversity? 2.And in background noise limited case,Is the noise seen on each receiver the same,irrespective of area?So,if i have M receivers, total noise is M*noise variance of a single receiver(of area same as the total area of all M receivers)?or it depends upon area of receiver. 2. The thermal noise on each receiver depends on the receiver analog filter bandwidth. One can expect the analog filters for all the receivers to be the same. Even i fell the same. If you find the better reasoning please let me know. @Sham Sunder K: Thats a difficult question, and I also do not know the answer. The only reason which I can vaguely propose is that with multiple copies of the received symbol, the receiver chain with the higher snr dominates the ber. Please do let know if you can think of a better argument. Figure SNR improvement with EGC shows that we get approx 3dB gain with No. Rx Ant 2 when compared to one Rx Ant. 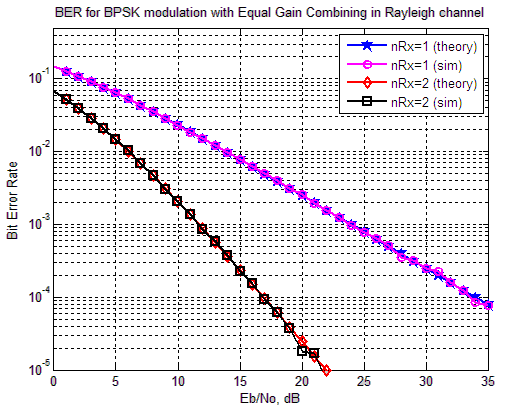 But If we see the BER curves of the same we get more than 3 dB gain. What might be the reason?? In fact, I’m looking for topics discussing multiple transmit antennas with EGC or MRC combining techniques (M transmitter antennas, N receiver antennas and a combining technique…). Really, I don’t know the limitations of this case, but I’m trying to work on this aspect. But, as well as I can remark this is only for receiver diversity, have any matlab code for both side diversity (N transmitter and M receiver antennas)? and i said more details there. @mohamadali: I have not yet taken up a detailed study of MC-CDMA to answer your request. However, I am hoping that you will be able to adapt the information given in this post to meet your requirement. @Shabeer: Using the posts on OFDM (www.dsplog.com/tag/ofdm), it maybe reasonably easy to adapt for multiple antennas, different FFT sizes etc. Hope this helps. Good luck. could you please show the performance of MRC, ORC and MMSE equalizers for MC-CDMA systems in rayleigh channels?